Join us for a day of vintage clothing & craft shopping! What a great opportunity to get dressed up in your favourite vintage or retro outfits and visit us in Burns Hall. We'll make sure it's jam packed with colourful, unique stalls and friendly people. Our last market for the year is a great opportunity to find an amazing outfit for Christmas day and the summer holiday's. You'll be sure to find unique, one off, locally hand made treasures, ranging from dresses and hats to Christmas decorations and much more! 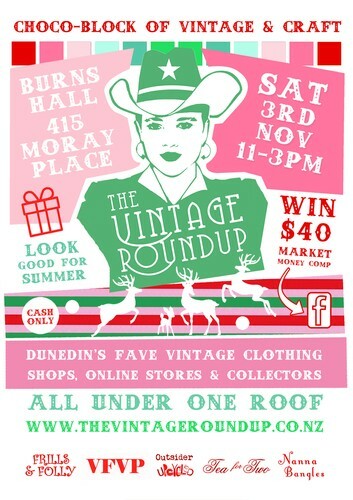 The Vintage Roundup is a vintage clothing and craft market which brings together the very best of Otago's vintage clothing and craft scene. Vintage lovers can hunt for treasures with all of their fave vintage clothing shops, online sellers, crafters & collectors all under one roof! Visit our Facebook page to see how you can win $40 market money to spend on the day!